As you have probably noticed, I’ve been getting a bit into Kickstarter over the last couple of years, and that has caused a few dents in the wallet, but has yielded some good games (one or two disappointments) and a load of waiting for stuff. Anyway, the latest thing I have stumbled across is an exceptionally cute card and dice game called Bedtime Heroes, which has the added advantage (for me) of being a UK-based project, though they will also be shipping from the USA if it all goes through. Image stolen from the Bedtime Heroes Kickstarter page. 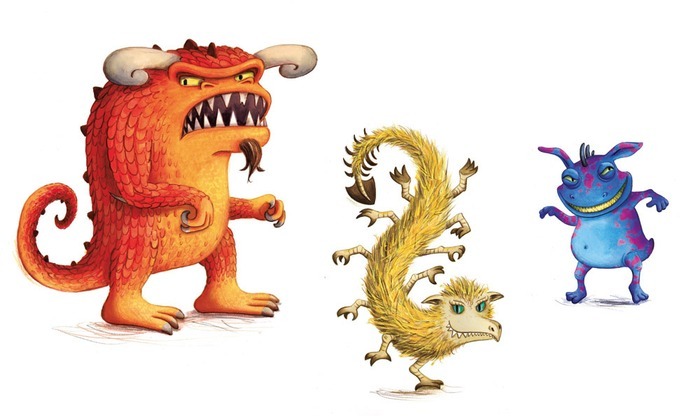 Are these cute monsters or what? Basically the game is about using heroic toys to protect a dreaming child from monsters that appear from the cupboard or under the bed. You defeat monsters by rolling dice and being lucky, but can modify die die rolls by using the toys that you have acquired along the way. You get those toys by buying them in a “closed-fist” type auction, in which you spend chocolate coins. Don’t worry, the chocolate coins don’t go in your fist — they’d melt — you use cards for the secret bidding. That’s about it. I was a bit concerned when I saw the time range of 15 to 60 minutes — that seems ludicrously variable — but I think this range is because you can control the length of the game by varying the number of monsters that need defeating. Edit: Steve, the game’s creator, has just sent me a message to say the 60 minutes would be exceptionally rare, so he’ll change the description to a more plausible 15 to 30 minutes. The whole thing looks lightweight, quick, fun, and almost overwhelmingly cute, with artwork that has the monsters looking kinda menacing but also a little cuddly. I’m definitely happy to back this based on what I’ve seen. If you’re interested, there is a free print and play version of the game (with black & white line art rather than the full colour experience) linked from the project page (this is hosted on BoardGameGeek, so you’ll need an account there in order to download), or you could just grab the (very simple) rules to take a look (this isn’t on BGG, so anyone can get it). Having watched the videos on Kickstarter, Miss B says that the game looks good and she wants to try it out, so there you go. I may get around to making the print and play set. If I do, and we play it before the campaign is over, I’ll let you know how it goes. Time for another quick heads-up about a Kickstarter project that might be of interest. This one is called All Bunnies Eat Carrots and it is a cute card game about… well, bunnies, of course. Image stolen from the ABEC Kickstarter page. I think the lettuce is a serving suggestion. I am not a rabbit person, though I know a number of people who are, to say the least. This looks like it could be quite a fun little game though. The idea is that you are trying to collect bunnies by convincing them to stay with you by pandering to their needs. And what are their needs? Well, it’s stuff like carrots and rabbit food, but also glasses and hats and bows and stuff because… well, bunny crazy is a lot like cat crazy really. I don’t know if there is a pancake to balance on a rabbit’s head. The rules are linked from the Kickstarter page and there is a video demonstrating play, during which they get through a 2 player game, including a load of explanation, in about 10 minutes, so you can get a decent idea of what is on offer here. To be completely honest I am a little bit torn about this game. I’m not instantly enthused about the game itself as I have been about some others, but it is extremely cute (some would say sickeningly so), looks like it should be at least a bit of light fun as a family game, and is clearly massively infused with love and enthusiasm from its creators. This is one major reason why I am considering pledging to this project. Where so many game Kickstarters are enormous, flashy projects, produced by established companies or, at the other end of the spectrum, clueless and naive rubbish, it’s great to see a project that appears to be a genuine labour of love. 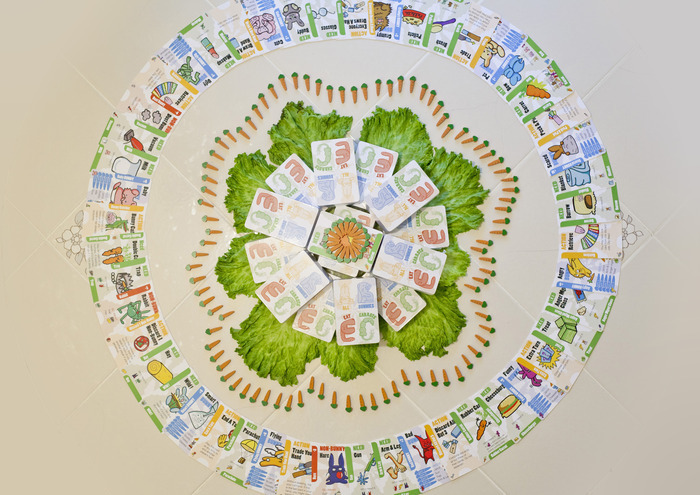 All Bunnies Eat Carrots is being produced by a lovely couple of people (I have been exchanging messages with one of the creators on Board Game Geek) who really believe in what they are doing, but appear to be listening to advice and trying to make the best game they can. Or the best game about bunnies, at least. So, if you are obsessed with rabbits, or you want to support this sort of enterprise, you could go over to their Kickstarter page and have a look. I’ve got a funny feeling that I’m going to end up pledging after all. The cute, it hurts…! I haven’t posted about a Kickstarter project for a while. I’ve backed a few recently (mostly small and cheap ones), but I’m trying to not get into having a “Kickstarter Corner” on the blog so I’ll just post about the ones that particularly tickle me. Arrr! There even be pirates in this game, plus this here image stolen from the Kickstarter page. And the game that has done the tickling recently is Oddball Aeronauts, which is basically a small card battle game based largely on Top Trumps and themed with anthropomorphised animals flying around in airships. The idea is that while you do the statistic matching as per the perennial kids’ game (that Miss B absolutely loves, incidentally, especially her Doctor Who deck), you have the choice of boosting the statistics of your first card by using the one or two cards behind it in the deck. Plus there are assorted special effects that switch things around a bit, all adding to what looks like some meaningful decision making. Miss B was totally sold after watching a couple of the videos on the Kickstarter page, and I figure this looks like it should at least be a fun, portable filler game — one of the major selling points is that you don’t even need a table to play on. 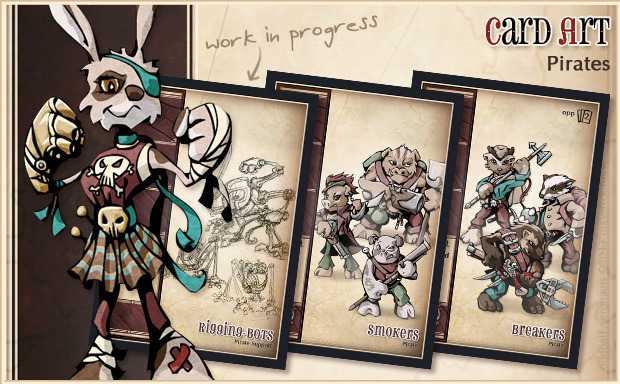 So, if this looks like your sort of thing then Oddball Aeronauts’ Kickstarter is running for about another week. It’s British too, which is nice to see. As a quick interruption to your regular reading, I feel slightly compelled to draw your attention to a Kickstarter project that caught my eye a couple of days ago. It’s only got a few days left to run and is looking sadly like it may not hit its goal, but as I’d really like to get a copy of the game I thought I’d do what I could to help their publicity. Anyhoo, remember those list memorising games you played in the car as a kid? You know, you say something like, “I went on holiday and I packed a toothbrush.” Then your sister says, “I went on holiday and I packed a toothbrush and a swimming costume.” And the game continues with the list getting longer and harder to remember. 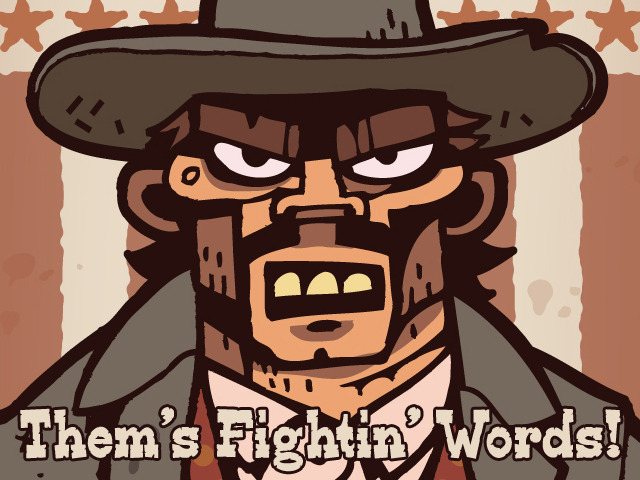 Them’s Fightin’ Words is basically that same game transported into the wild west, based on hurling ever more convoluted insults (“You low-down, lily-livered son of a dirty, lollygaggin’ rattlesnake.”) and given some cards. I have no affinity to these guys. As I say, I just really like the look of this (along with its predecessor, Jazz the Singing Game), so please take a look and see if it’s something you want to back. It certainly made me smile, particularly after watching the promo video. Look! Vanilla Scoop has ice cream! A year ago we started playing Goblins Drool, Fairies Rule! as a print and play game which was released to support a very successful Kickstarter campaign. We enjoyed it then (and posted here about it) and have played it from time to time since. Cobweb Shock flips nobody and sends home… nobody. Good, that’s another goblin disposed of. Printing of the game was delayed quite a lot but finally, about six months after it was due, our copy has just arrived in the post. So, of course, we had to give it a play. Our print and play version only had a sample of the artwork, so we were very pleased to get hold of the thick, oversized, beautifully illustrated final product, housed in a nice little tin. 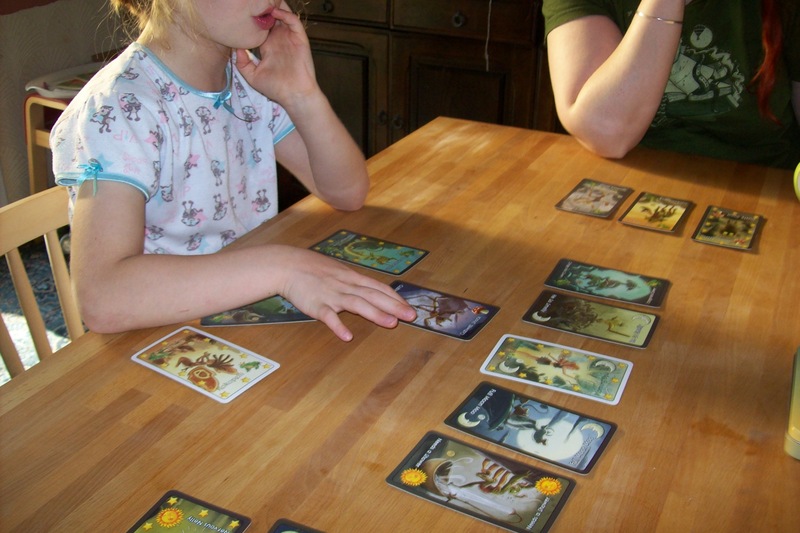 This is also a game that S. likes, so the three of us sat down for a couple of games. Miss B gets on well with this, though it can be a little brain bending to figure out the effect of playing a card, working out which cards will flip and which will be sent back to you. But Miss B has got into the habit of systematically working out each possible play and talking through what would happen in each case before making a decision. This makes things a little slow, but it’s good to see her thinking about all this. To be fair, most adults need to go through a similar process. I certainly do, though I do it in my head. An adult game could also involve working out what the next player wants and trying to scupper their plans, but we don’t worry about such things with Miss B. The verdict from Miss B (aged nearly 6½): “Goblins Drool Fairies Rule! has got some wonderful illustrations but I think there should be a little bit of a change to the rules.” She didn’t let me know what changes she thought would be necessary, but she did say that she liked the game but prefers Love Letter. The game: Goblins Drool, Fairies Rule! (Game-O-Gami), 1 to 4 players aged 7+. Carrots and rubies and trees, oh my! I feel a little bit sheepish about this one, as Eight-Minute Empire is a recent Kickstarter project that we only got to try out (via a print and play version) in the dying hours of the project, so by the time this post gets out there you’ll have missed the opportunity to back it. Still, in a few months it should be available through some other path. Seriously, how many games allow you to move armies and collect carrots at the same time? Being a print and play game we had some work to do before we could play, so while I assembled and laminated the board and scavenged counters and wooden cubes from other games, Miss B stuffed the cards (and some other cards to give them some bulk) into sleeves. As this wasn’t too much preparation and didn’t take too long, it all went well and added something of a sense of real ownership to the game. This is a simple area control game with a bit of card set collection thrown in for good measure and it is, I must say, a cracking little game. According to the designer it’s playable in about eight minutes (hence the title). That’s possible, I guess: even given that it was our first game and playing with Miss B always takes longer than the box predicts, we still managed to play in about half an hour. That alone makes this solid gold in my books. Miss B took to it very quickly (correctly predicting a couple of rules before I had explained them) and we both had a great time playing. Of course, this being a print and play prototype, not everything was perfect. Probably our biggest issue was that the cards were slightly too large for the board so they didn’t properly line up with the cost markers on the board. I assume the final version should be tidying up this sort of thing. 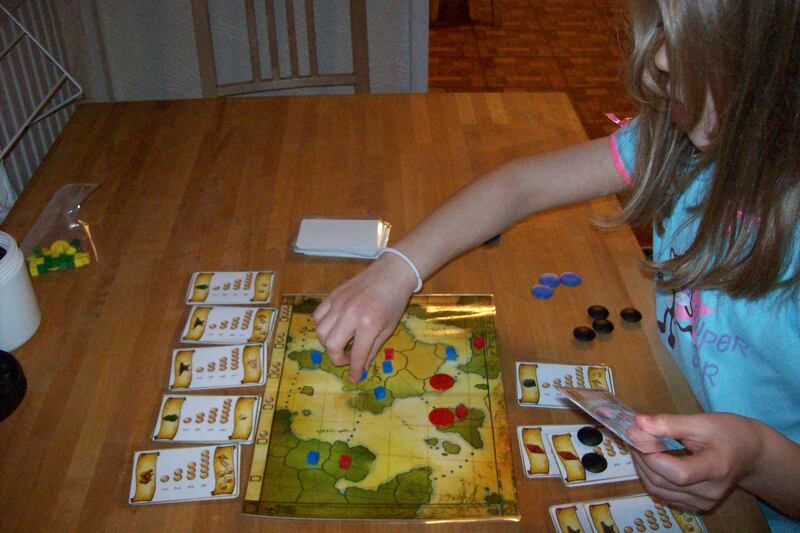 The game: Eight-Minute Empire (Red Raven Games), 2 to 4 players aged 8+ (I think).